This article is a direct translation of nampiLLai's avathArikai (introduction) for bhUthathAzhwAr's iraNdAm thiruvanthAdhi. Thanks to srI U. vE. M A vEnkatakrishNan swamy's monumental effort in locating these vyAkyAnams of nampiLLai and publishing the same and also providing easy to follow thamizh explanation for these wonderful commentaries. 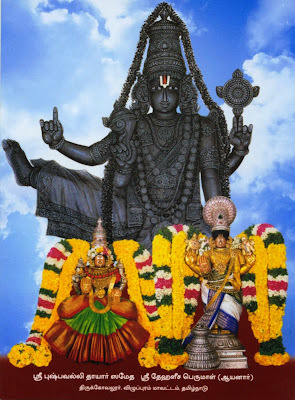 Please read poigai AzhwAr's mudhal thiruvanthAdhi introduction at http://ponnadi.blogspot.in/2013/10/aippasi-anubhavam-poigai-azhwar.html and bhUthAthAzhwAr's iraNdAm thiruvanthAdhi introduction at http://ponnadi.blogspot.in/2013/10/aippasi-anubhavam-bhuthathazhwar.html. 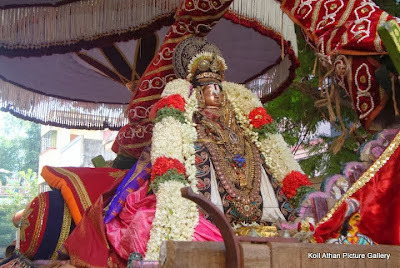 pEyAzhwAr declares that by the grace of poigai AzhwAr and bhUthathAzhwAr, he had the divine vision of emperumAn who is the divine consort of srI mahAlakshmi and is like a rathnAkaram (rathnAkaram means ocean - emperumAn is compared to rathnAkaram here - just like an ocean is filled with many jewels, emperumAn is filled with auspicious qualities). No one can understand the full meanings of this thiruvanthAdhi as this is a spontaneous outpouring (without any sequence) of AzhwAr's emotions after having the divine vision of emperumAn with pirAtti. Because of such spontaneous speaking he is called pEyar (one who is not cohesive in his speeches and looking wierd). kulasEkara AzhwAr also mentions "pEyarE enakku yAvarum yAnumOr pEyanE evarkkum ... pEyanAyozhinthEn embirAnukkE" (பேயரே எனக்கு யாவரும் யானுமோர் பேயனே எவர்க்கும் ... பேயனாயொழிந்தேன் எம்பிரானுக்கே) - mundane minded people looks wierd for him due to their attachment for mundane things and he looks wierd for mundane minded people as he is completely attached to bhagavAn alone. poigai AzhwAr's mudhal thiruvanthAdhi is an outcome of the divine blessing of blemishless knowledge (which is matured into bhakthi) to poigai AzhwAr by bhagavAn (this is the state of para bhakthi). As bhUthAthAzhwAr's iraNdAm thiruvanthAdhi's last pAsuram indicates "enRan aLavanRAl yAnudaiya anbu" (என்றன் அளவன்றால் யானுடைய அன்பு) - AzhwAr saying to emperumAn "my loving devotion towards you is even greater than myself" - that represents the ultimate stage of para bhakthi (which is the beginning of para gyAnam). Naturally, the next stage is bhagavath sAkshAthkAram (outcome of parama bhakthi). pEyAzhwAr declares that emperumAn himself revealed him (along with pirAtti). poigai AzhwAr established emperumAn as the owner of both nithya vibhUthi (spiritual world) and leelA vibhUthi (material world). bhUthAthAzhwAr established such owner of both worlds is identified as nArAyaNan. Here, pEyAzhwAr identifies that the term "srImath" should be added to nArAyaNan to make him srIman nArAyaNan. "vaiyam thagaLi" (வையம் தகளி - mudhal thiruvanthAdhi 1) indicates gyAnam (knowledge) that bhagavAn is the master and others are subservient/secondary to him. "anbE thagaLi" (அன்பே தகளி - iraNdAm thiruvanthAdhi 1) indicates the matured of gyAnam, that is parabhakthi (ultimate loving devotion). This mUnRAm thiruvanthAdhi explains the next stage which is bhagavath sAkshAthkAram (divine vision). poigai AzhwAr explained the true nature sEshi (master) - bhagavAn (that he is the controller of everything). bhUthathAzhwAr explained the true nature of sEsha bhUthan (servitor) - jIvAthmA (that he is a loving servant of bhagavAn). pEyAzhwAr explains the nature of the cause for the qualities of bhagavAn and jIvAthmA - i.e., pirAtti is the one who ensures bhagavAn protects everyone and jIvAthmAs understand their natural position and surrender unto emperumAn - so, here in this prabhandham pirAtti's relationship with bhagavAn is explained. Just like emperumAn churned the ocean and as a result, dhEvas were blessed with nectar, pEyAzhwAr was blessed with the efforts of poigai AzhwAr and bhUthathAzhwAr in lighting the lamp and had the nectarean vision of emperumAn with pirAtti. Thus ends nampiLLai's introduction to mUnRAm thiruvanthAdhi. Let us briefly see the thaniyan for mUnRAm thiruvanthAdhi which was composed by kurugai kAvalappan. thaniyans usually reveal the glories of the author of the prabhandham and the prabhandham itself. Simple translation: kurugai kAvalappan saying to his heart "My heart! Please happily speak about the glories of the lotus feet of pEyAzhwAr who had the divine vision of srIman nArAyaNan who looks like a beautiful dark cloud in the idaikazhi (porch/veranda) in thirukkOvalUr which has many beautiful palaces". Let us now see the summary of these introductions briefly. The main theme is in explaining the 3 different stages of devotion - parabhakthi, paragyAnam and parama bhakthi. As explained by nampiLLai himself, though all the AzhwArs manifest all these stages in them (as they are all divinely blessed by bhagavAn with blemishless knowledge), the three stages of devotion is explained by the first pAsurams of three dhivya prabhandhams. 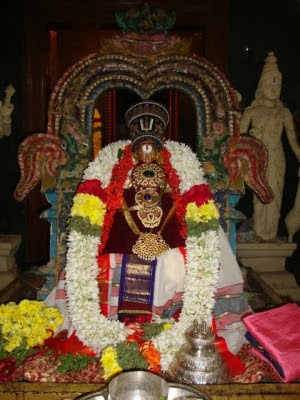 This is similar to nammAzhwAr enjoying a particular auspicious quality of archAvathAra emperumAn in each dhivyadhEsam even though all archAvathAra emperumAns have all auspicious qualities (Please visit http://ponnadi.blogspot.in/2012/11/archavathara-anubhavam-nayanar-anubhavam.html for a brief explanation of this and https://docs.google.com/file/d/0ByVemcKfGLucWnNuNVJiRkdXa0E/edit?usp=sharing for a detailed explanation of the same). We can further understand the deeper meanings of this principle of 3 stages of devotion in the coming section. azhagiya maNavALa perumAL nAyanAr explains these 3 stages in his beautiful grantham named AchArya hrudhayam which fully reveals the divine heart of nammAzhwAr. He explains these 3 stages in chUrNikai 233 as follows. ivai gyAna dharsana prApthi avasthaigaL. இவை ஜ்ஞான தர்சன ப்ராப்தி அவஸ்தைகள். Simple translation: para bhakthi, para gyAnam and parama bhakthi relates to gyAnam (true knowledge about emperumAn), dharsanam (vision) and prApthi (unable to bear separation from emperumAn for even a moment) stages. mAmunigaL beautifully explains this principle quoting bhAshyakArar's divine request in his sharaNAgathi gadhyam and srIranganAthan's reply for the same. para bhakthi - gyAnam - being happy when together with emperumAn and being sad in separation. Thus, we have seen a glimpse of glories of mudhalAzhwArs and their dhivya prabhandhams through nampiLLai's avathArikais (introductions) of the three thiruvanthAdhis.